Rahinah Ibrahim is a slight Malaysian woman who attended Stanford University on a U.S. student visa, majoring in architecture. She was not a political person. Despite this, as part of a post-9/11 sweep directed against Muslims, she was investigated by the FBI. In 2004, while she was still in the U.S. but unbeknownst to her, the FBI sent her name to the no-fly list. Ibrahim was no threat to anyone, innocent of everything, and ended up on that list only due to a government mistake. Nonetheless, she was not allowed to reenter the U.S. to finish her studies or even attend her trial and speak in her own defense. Her life was derailed by the tangle of national security bureaucracy and pointless “anti-terror” measures that have come to define post-Constitutional America. Here’s what happened, and why it may matter to you. On September 10, 2001, there was no formal no-fly list. Among the many changes pressed on a scared population starting that September 12th were the creation of two such lists: the no-fly list and the selectee list for travelers who were to undergo additional scrutiny when they sought to fly. If you were on the no-fly list itself, as its name indicated, you could not board a flight within the U.S. or one heading out of or into the country. As a flight-ban plan, it would come to extend far beyond America’s borders, since the list was shared with 22 other countries. No one knows how many names are on it. According to one source, 21,000 people, including some 500 Americans, are blacklisted; another puts the figure at 44,000. The actual number is classified. 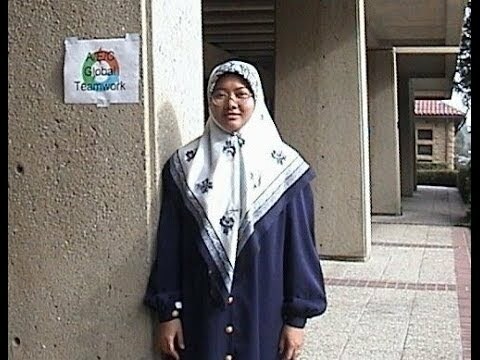 On January 2, 2005, unaware of her status as a threat to the United States, Ibrahim left Stanford for San Francisco International Airport to board a flight to Malaysia for an academic conference. A ticket agent saw her name flagged in the database and called the police. Despite being wheelchair-bound due to complications from a medical procedure, Ibrahim was handcuffed, taken to a detention cell, and denied access to medication she had in hand. Without explanation, after extensive interrogation, she was allowed to board her flight. When she tried to return to America to resume her studies, however, she found herself banned as a terrorist. Stuck in Malaysia, though still in possession of a valid student visa, Ibrahim filed a lawsuit against the U.S. government, asking to be removed from the no-fly list and allowed back into the country to continue her architectural studies. Over almost nine years, the U.S. Department of Justice (DOJ) employed an arsenal of dodges and post-9/11 tricks to impede her lawsuit, including invoking the “state secrets doctrine” to ensure that she would never have access to the records she needed. “State secrets” is not a law in the U.S., as it is, for example, in Great Britain, where the monarch also retains “Crown Privilege,” the absolute right to refuse to share information with Parliament or the courts. Here, it is instead a kind of assumed privilege and the courts accept it as such. Based on it, the president can refuse to produce evidence in a court case on the grounds that its public disclosure might harm national security. The government has, in the past, successfully employed this “privilege” to withhold information and dead-end legal challenges. Once “state secrets” is in play, there is literally nothing left to talk about in court. A related DOJ dodge was also brought to bear in an attempt to derail Ibrahim’s case: the use of made-up classification categories that dispatch even routine information into the black world of national security. Much of the information concerning her placement on the no-fly list, for instance, was labeled Security Sensitive Information (SSI) and so was unavailable to her. SSI is among hundreds of post-9/11 security categories created via memo by various federal agencies. These categories, too, have no true legal basis. Congress never passed a law establishing anything called SSI, nor is there any law prohibiting the disclosure of SSI information. The abuse of such pseudo-classifications has been common enough in the post-9/11 years and figured significantly in the ongoing case of Transportation Security Administration (TSA) whistleblower Robert MacLean. Next in its end-run around Ibrahim’s lawsuit, the DOJ pulled “standing” out of its bag of tricks. Standing is a legal term that means a person filing a lawsuit has a right to do so. For example, in some states you must be a resident to sue. Seeking to have a case thrown out because the plaintiff does not have standing was a tactic used successfully by the government in other national security cases. The ACLU, for instance, sued the National Security Agency for Fourth Amendment violations in 2008. The Supreme Court rejected the case in 2013 for lack of standing, claiming that unless the ACLU could conclusively prove it had been spied upon, it could not sue. In the wake of the Edward Snowden revelations showing that the NSA indeed spied widely on American citizens, the ACLU has revived the suit. It claims that the new documents provide clear evidence of broad-based surveillance and so now give it standing. Standing was also used by the DOJ in the case of American citizen and purported al-Qaeda member Anwar al-Awlaki, whom the U.S. murdered by drone in Yemen. Prior to his son’s death, attorneys for al-Awlaki’s father tried to persuade a U.S. District Court to issue an injunction preventing the government from killing him. A judge dismissed the case, ruling that the father did not have standing to sue. In Ibrahim’s no-fly case, the government argued that since she was not an American citizen, she had no standing to sue the government for its actions against her in the U.S. When all of those non-meritorious challenges failed to stop the case, the government invoked the very no-fly designation Ibrahim was challenging, and refused to allow her to travel to the United States to testify at her own trial. Next, Ibrahim’s daughter, an American citizen traveling on a U.S. passport, was not allowed to board a flight from Malaysia to serve as a witness at her mother’s trial. She, too, was told she was on the no-fly list. After some legal tussling, however, she was finally allowed to fly to “the Homeland.” Why the American government changed its mind is classified and almost all of the trial transcript concerning the attempt to stop her from testifying was redacted from public disclosure. In addition, by regularly claiming that classified information was going to be presented, the government effectively hid the ludicrous nature of the Ibrahim case from much public scrutiny. The trial was interrupted at least 10 times and the public, including journalists, were asked to leave the courtroom so that “classified evidence” could be presented. A message of intimidation had been repeatedly delivered. It failed, however, and Ibrahim’s case went to trial, albeit without her present. Despite years of effort by the DOJ, Ibrahim won her lawsuit. The U.S. District Court for Northern California ordered the removal of her name from the no-fly list. However, in our evolving post-Constitutional era, what that “victory” revealed should unnerve those who claim that if they are innocent, they have nothing to fear. Innocence is no longer a defense. During the lawsuit, it was made clear that the FBI had never intended Ibrahim to be placed on the no-fly list. The FBI agent involved in the initial post-9/11 investigation of Ibrahim simply checked the wrong box on a paper form used to send people into travel limbo. It was a mistake, a slip up, the equivalent of a typo. There was no evidence that the agent intended harm or malice, nor it seems were there any checks, balances, or safeguards against such errors. One agent could, quite literally at the stroke of a pen, end someone’s education, job, and family visits, and there was essentially no recourse. Throughout the nine years Ibrahim fought to return to the U.S., it appears that the government either knew all along that she was no threat and tried to cover up its mistake anyway, or fought her bitterly at great taxpayer expense without at any time checking whether the no-fly designation was ever valid. You pick which theory is most likely to disturb your sleep tonight. Having won her case, Ibrahim went to the airport in Kuala Lumpur to fly back to Stanford and resume her studies. As she attempted to board the plane, however, she was pulled aside and informed that the U.S. embassy in Malaysia had without notice revoked her student visa. No visa meant, despite her court victory, she once again could not return to the United States. At the U.S. embassy in Kuala Lumpur, Ibrahim was handed a preprinted “explanation” for the visa revocation with the word “terrorist” hand-written next to the boilerplate text. Ibrahim was never informed of her right under U.S. law to apply for a waiver of the visa revocation. 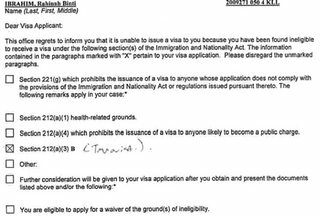 Though it refused to re-issue the visa, the State Department finally had to admit in court that it had revoked the document based solely on a computer “hit” in its name-checking database, the Consular Lookout and Support System (CLASS.) That hit, in turn, appeared to be a straggler from the now defunct no-fly list entry made erroneously by the FBI. As is well known, the State Department issued legal visas to all of the 9/11 terrorists. In part, this was because the CIA and other U.S. intelligence agencies failed to tell State what they knew about the hijackers, as all were suspected to be bad guys. Then and now, such information is passed on when intelligence and law enforcement agencies make electronic entries in State’s computerized lookout system. CLASS is part of the Consular Consolidated Database, one of the largest known data warehouses in the world. As of December 2009, it contained over 100 million cases and 75 million photographs, and has a current growth rate of approximately 35,000 records per day. CLASS also collects the fingerprints of all foreigners issued visas. Pre-9/11, various agencies in Washington were reluctant to share information. Now, they regularly dump enormous amounts of it into CLASS. The database has grown 400% since September 11, 2001. The problem is that CLASS is a one-way street. Intelligence agencies can put data in, but can’t remove it because State keeps the database isolated from interactive data maintenance. In addition, the basic database it uses to screen out bad guys typically only has a subject’s name, nationality, and the most modest of identifying information, plus a numerical code indicating why a name was entered. One code, 3B, stands for “terrorist”; another, 2A, means “criminal”; and so forth through the long list of reasons the U.S. would not want to issue a visa. Some CLASS listings have just a partial name, and State Department visa-issuing officers regularly wallow through screen after screen of hits like: Muhammad, no last name, no date of birth, Egypt — all marked as “critical, Category One” but with no additional information. Nor, when the information exists but was supplied by another agency, do U.S. embassies abroad have direct access to the files. Instead, when a State Department official gets a name “hit” overseas, she must send a “Security Advisory Opinion,” or SAO, back to Washington asking for more information. The recipient of that cable at Foggy Bottom must then sort out which intelligence agency entered the data in the first place and appeal to it for an explanation. At that point, intelligence agencies commonly to refuse to share more, claiming that no one at State has the proper clearances and that department should just trust their decision to label someone a bad guy and refuse to issue, or pro-actively revoke, a visa. If, on the other hand, information is shared, it is often done on paper by courier. In other words, a guy shows up at State with a bundle of documents, waits while someone reviews them, and then spirits them back to the CIA, the FBI, or elsewhere. That way, the intelligence agencies, always distrustful of State, are assured that nothing will be leaked or inadvertently disclosed. In cases where no more information is available, or what is available is inconclusive, the State Department might allow the visa application to pend indefinitely under the heading “administrative processing,” or simply “prudentially” revoke or not issue the visa. No one wants to risk approving a visa for the next 9/11 terrorist, even if it’s pretty obvious that the applicant is nothing of the sort. This undoubtedly is what happened to Ibrahim. Though the details remain classified, State certainly didn’t possess super secret information on her unavailable to other law enforcement or intelligence outfits. Some official surely decided to take no chances and revoked her visa “prudentially” based on the outdated information still lodged in CLASS. Ibrahim’s case also reveals just how many secret databases of various sorts exist in Washington. Here’s how a name (your name?) gets added to one of those databases, and how it then populates other lists around the world. A name is nominated for the no-fly list by one of hundreds of thousands of government officials: an FBI agent, a CIA analyst, a State Department visa officer. Each nominating agency has its own criteria, standards, and approval processes, some — as with the FBI in Ibrahim’s case — apparently pretty sloppy. The nominated name is then sent to the Terrorist Screening Center (TSC) at a classified location in suburban Northern Virginia. TSC is a multi-agency outfit administered by the FBI and staffed by officials from the Department of Homeland Security, the Department of State, and all of the Intelligence Community. *and finally, an unknown number of other law enforcement and intelligence agency databases, as well as those of other foreign intelligence services with which information may be shared. As Ibrahim discovered, once a name is selected, it travels deep and far into both U.S. and foreign databases. If one clears one’s name from one database, there are many others out there waiting. Even a comprehensive victory in one nation’s courts may not affect the records of a third country. And absent frequent travel, a person may never even know which countries have him or her on their lists, thanks to the United States. Once she learned that her student visa had been revoked in Malaysia, Ibrahim sued again, asking that the State Department reissue it. The government successfully blocked this suit, citing a long-established precedent that visa matters are essentially an administrative function and so not subject to judicial review. A court did scold State for failing to notify Ibrahim of her right to seek a waiver, as it was required to do by law. To the extent that Ibrahim’s case has any life left in it, her next step would be to return to the Department of Justice’s bailiwick and apply for a waiver of the revocation the State Department made based on data given to it by the DOJ that both outfits know was struck down by a court. It’s that “simple.” Meanwhile, she cannot return to the U.S.
A common trope for those considering the way the National Security Agency spies on almost everyone everywhere all the time is that if you have nothing to hide, you have nothing to fear. If your cell phone conversations are chit-chats with mom and your emails tend toward forwards of cute cat videos, why should you care if the NSA or anyone else is snooping? Ask Rahinah Ibrahim about that. She did nothing wrong and so should have had nothing to fear. She even has a court decision declaring that she never was nor is a threat to the United States, yet she remains outside America’s borders. Her mistaken placement on the no-fly list plunged her head first into a nightmarish world that would have been all too recognizable to Franz Kafka. It is a world run by people willing to ignore reality to service their bureaucratic imperatives and whose multiplying lists are largely beyond the reach of the law. Sad as it may be, the Ibrahim case is a fairly benign example of ordinary Washington practices in the post-9/11 era. Ibrahim is going about her life at peace in Malaysia. Her tangle with the United States seems to have been more a matter of bureaucratic screw-ups than anything else. No one sought to actively destroy her. She was not tortured in a CIA black site, nor left for years in a cage at Guantanamo. Her case is generally seen as, at worst, another ugly stain on the white wall we imagine we are as a nation. But the watch lists are there. The tools are in place. And one thing is clear: no one is guarding the guards. You never know whose name just went on a list. Maybe yours? Peter Van Buren blew the whistle on State Department waste and mismanagement during Iraqi reconstruction in his first book, We Meant Well: How I Helped Lose the Battle for the Hearts and Minds of the Iraqi People. A TomDispatch regular, he writes about current events at his blog, We Meant Well. His latest book, a novel, Ghosts of Tom Joad: A Story of the #99Percent, is now available.